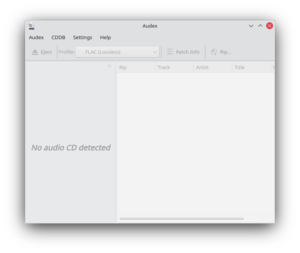 Difference between revisions of "Audex"
Audex is an easy to use audio CD ripping application. In fact its interface should be so easy to use, this help page may be not necessary at all. The user only needs to decide which format is desired from the rip, and '''Audex''' will offer all the options that can be used, based on the codecs on your system. * Ripping with CDDA Paranoia. * Supports Ogg Vorbis, FLAC, MP3, WAV, AAC and custom commandline encoders. * Extensive filename schemes (see documentation). * Metadata correction tools (like capitalization). * Retrieve covers from the internet. * Create playlists, covers and template based info files. Extensive filename schemes (see documentation).